On Thursday, I joined Morgan Miller, a cider export most of us know more as a Ninkasi guy, and Jeff and Erin Smith, owners/cidermakers at Bushwhacker's. I was there gathering deep background on the world of apples and cider making, and in the course of our chat, we sampled a lovely English cider from Hogan's, a French basque cider from Bordatto (which tasted a lot more French than Basque), and a Pommeau, which is a blend of calvados apple brandy back-sweetened with apple juice. And, while we were chatting, we got off on the subject of mass market ciders--or what Morgan calls "draft cider." These are the brands like Strongbow in England and Woodchuck and Angry Orchard here in the states. I only really started drinking ciders seriously a couple years back, and like any newbie, I had no idea what ciders were supposed to taste like. As Jeff pointed out, they are conceptually very easy to grasp: fermented apple juice. This leads to expectations of an appley flavor and after you've worked your way through a few supermarket varieties, you might start to expect vibrant effervescence and a fair amount of sweetness. They are to ciders what Budweiser and Coors are to beer--sweetish products engineered to appeal to a broad market. Like so many newbies exposed to a mass market product, I wasn't really sure what I was supposed to be tasting. Like any product, mass market ciders have particular features that distinguish them from traditional ciders. (I prefer "mass market" to "draft cider," which misguides the mind to ignore the supermarket, where the vast majority of these guys reside--at least in the US.) Although traditional ciders are about equidistant between beer and wine from a sensory perspective, mass market ciders slide into the slot occupied by mass market beers--easy drinking, sessionable drinks. They're fizzy, taste like supermarket apples, and end with a soda-sweet kiss. They differ from traditional ciders, which are drier (sometimes very much so), balanced liquids with tannins and acids, sometimes funky yeast character, and which may be still or have champagne-like effervescence. In Oregon, our minds colored by the brewing industry, we tend to think of local as the marker of not-mass market. But you can find Oregon and Washington ciders that are a lot more like Woodchuck than Hogan's. As we chatted, I probed a bit to find out how mass market ciders differ in terms of craft. Jeff pulled out a Strongbow's as we discussed them. 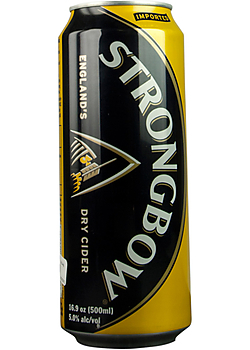 Strongbow's is one of the least interesting ciders I've ever tried--it's lightly fizzy and bland, with very little apple flavor or sweetness, just a cheap-lager tinniness and a flaccid, watery finish. For a beverage that couldn't be simpler--squeeze the apple, ferment the juice--there are a lot of ways to make ciders. In the industrial process, big companies start with juice or juice from concentrate and do a version of high-gravity brewing where they take a concentrated form of the juice, ferment it out, and then water it back down for the right abv. They adjust flavors by adding acids and sugar. They usually "back-sweeten" these ciders, as well. That's a process where the finished cider is pasteurized after fermentation and then has fresh juice added in to make it sweet and give it that apple flavor. Because dessert apples are mostly sugar--no tannins or acids--they ferment out and give you alcohol without a lot of flavor. Back-sweetening is a way of making the cider sweet and appley. As we talked, I happened to glance at the ingredients on the Strongbow can and found this: "Fermented apple juice or apple juice from concentrate, sugars, water, malic acid, ascorbic acid, sulphur dioxide (to preserve freshness and act as a sulfiting agent)." Some of the giveaways for a mass market cider are the flavors of Jolly Ranchers (very sweet, tinged with an artificial fruit flavor) or a "cooked" or stewed flavor. I have found them to have a watery flavor as well--something you mainly notice only in contrast, after you try real ciders made from whole fruit. It's probably not worth going on a campaign here against these products--like anything made for a national market, they are industrial products engineered for consistency. There are no doubt really good reasons for using concentrates and additives, and you end up with a product that tastes like it's made that way. But try a Strongbow next to a Wandering Aengus or Two Towns and just let your taste buds tell you the difference. See if you can spot the way whole fruit tastes and feels in the mouth, how the flavors are more integrated and vibrant. We're in that period of cider making that corresponds to about 1987 in craft brewing. There are a lot of products out there, and they vary quite a bit. Things will come to coherence eventually, but in the meantime, it's very much the case of caveat emptor. Train your palate and it will guide you.